I was part of an event at the Foreign Office yesterday which brought University Vice-Chancellors, department heads and career advisers together to talk to them about the EU as a potential career for their students. It was heartening, if surreal, to sit a foot or two away from William Hague as he said “the EU is vital to the UK’s interests”. This government has really thrown itself behind this issue, and as far as these things matter, the fact that the Foreign Secretary came along the day before the strategic defence review and two days before the comprehensive spending review is impressive. We kicked off with a film of students talking about what they knew (or perhaps more accurately didn’t know) about the opportunities that exist to work for the EU. Then Simon Fraser, the top civil servant at the FCO, who did two stints in Brussels, talked very personally about what he had got out of it. Many of the questions in the first part focused on the teaching of foreign languages in British schools and universities, something regulars will know I write about alot. I was then asked to be one of two case studies, just an example of what working in the EU can lead you to do, where I repeated pretty much what I have said on this blog before. There was, to coin a phrase, a lot of love in the room, and I was inundated at the end by requests to come and talk to students at this or that university. There is such a thing as overexposure (! ), so we’re thinking of a sort of “Back to College” scheme, where EU officials who come back to the UK every now and then make themselves available to talk at their old university, or maybe the university in their hometown. Let’s see if we can make that work. In the meantime, if you’re interested in finding out more, check out the Foreign Office site or the EU careers site. A round-up of UK-relevant issues on the Commission’s calendar for next week. Usual caveats apply. 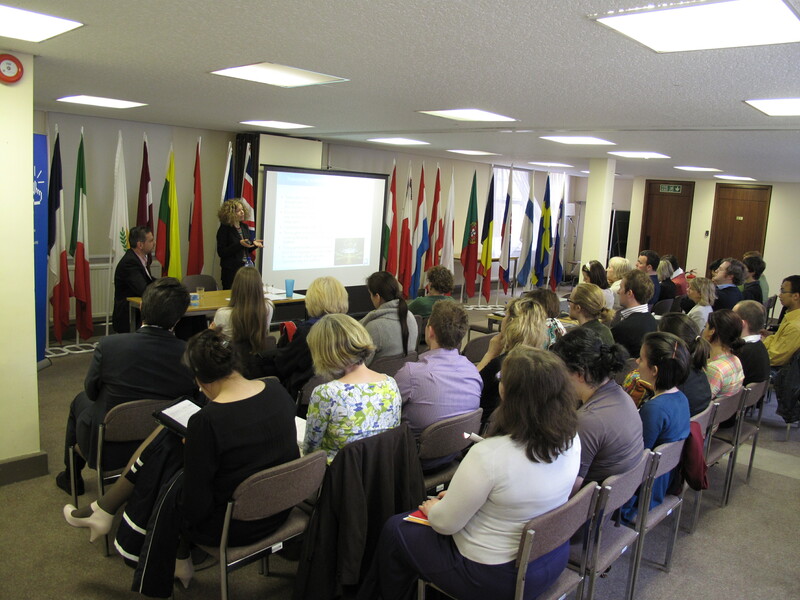 We hosted an event here today on language careers in the EU. In the first instance it was an opportunity to show the new clip done by the translation department showing what working as an EU translator is about. Three of us made brief presentations about the EU recruitment process, working as a conference interpreter and a lawyer-linguist and then we threw the floor open to questions. We had quite a mixed group of people – careers staff, students, recent graduates, freelance translator, even barristers – and the questions were pretty wide-ranging as well, though of course mainly focused on the recruitment procedure. The issue of how to get into working as a freelance translator for the Commission also came up quite a bit. The main message from our side was that if you are British and have a talent for languages, this is the perfect time to consider this career path. English is a pivotal language in the Commission as, like it or not, it is the default working language for most of the organisation. As letters, proposals, legislation etc come in from all the different Member States, they need to be translated into English so the Commission can work with them. Brits are currently under-represented in the EU institutions, including the Commission, so there is a real need for good British candidates. And the final element is that a significant number of the existing English translators are due to retire in the next few years. So just as English is more in demand than ever, it is facing a recruitment crisis. So if you apply and get through, there is little chance of languishing on the reserve list, unless you want to! This week is clearly careers week. I don’t think I’ve done a single careers talk since I arrived, and I’m doing two this week. On Monday we had someone from EPSO, our recruitment service, in the Rep holding open sessions for graduates (or soon-to-be-graduates) on the new round of recruitment and the new system. I was there to give a bit of a personal view of working in the Commission, describing my career path, and of course answering questions. The experience of new aspirants to an EU career will be a bit different from mine, as they will be taking tests designed to test competence and not knowledge. So no more questions about how many traffic accidents were there in the EU, or what is the weight of printer paper (both terrifyingly examples of questions in past competitions!). I was only at the final session of the day, but it was striking how many of the people who came along were from other Member States. Apparently this was less the case earlier in the day, but it raises yet again the issue I mentioned at Abingdon about the spectre of a loss of UK influence within the EU institutions. Tonight I’m going to City University to talk to their Sociology MA candidates about possible careers for social science students. Given that I did a social science Bachelors and am starting a Sociology MA at City in September, it seems a shoe-in for me to do! 1) I love being able to use languages on a daily basis (and so that’s something I really miss here). As a spokesperson I got to do interviews in French and English, brief journalists in those languages and German and improve my minor languages by reading the press cuttings. Really made all those years of language learning worth it. 2) I’m a bit of a butterfly (5 different posts and 4 houses during my 15 years in Brussels), so working for an organisation with such a broad range of subjects means I can imagine about a lifelong career without worrying about getting stuck in a rut. 3) Leading on from that, there’s something for everyone. If you’re a really technical type, whose life revolves around widget regulations, then you can spend your whole career on widgets. If you want to move around a lot you can. There are many jobs giving an overview of a broad policy area, and many that are highly specialised. 5) There is a strong element of idealism. I came to the view when I was a teenager that it is in our continent’s best interests to work together, and I was happy to be given the chance to work daily to make that happen. I’m sure if I sat down for a beer and talked about this, more would come up, but that’s it for the moment. If any of this strikes a chord with you, why not apply for one of the recruitment competitions coming up? If you’re on Facebook you can follow developments via the EU Careers fan page.